1. A budget-friendly framed photo to go OG in a gorgeous way that won't break the bank. 2. A custom gallery wall you can create if you're really going for all the Brownie points. Or if you and your siblings are going in for a group gift this year. Trying to piece together your own gallery wall is a fool's errand. I've also tried and loved this service! It helped me finally print out a few years of vacation, wedding, and holiday photos to make my apartment feel like home. Each gallery wall shipment comes with a paper format you can tape up to the wall with spots for the included hardware. So you can install it when she's distracted with wrapping some last-minute gifts for a heartfelt reveal without making a bunch of unnecessary holes in the wall. Get this four-photo set from Framebridge for $265+ (and check out more gallery wall designs). Ships within four to five days of ordering, order by Dec. 8 for holiday delivery. AND they're waterproof, and microwave- and dishwasher-safe! Get 32 0.75" stickers from Amazon for $17.99. 4. A gorgeous stocking that'll help the members of your fam who can't read just yet figure out which one to make a beeline to come Christmas morn. Get it from Walmart for $29.99. And check out more custom stocking styles. 5. 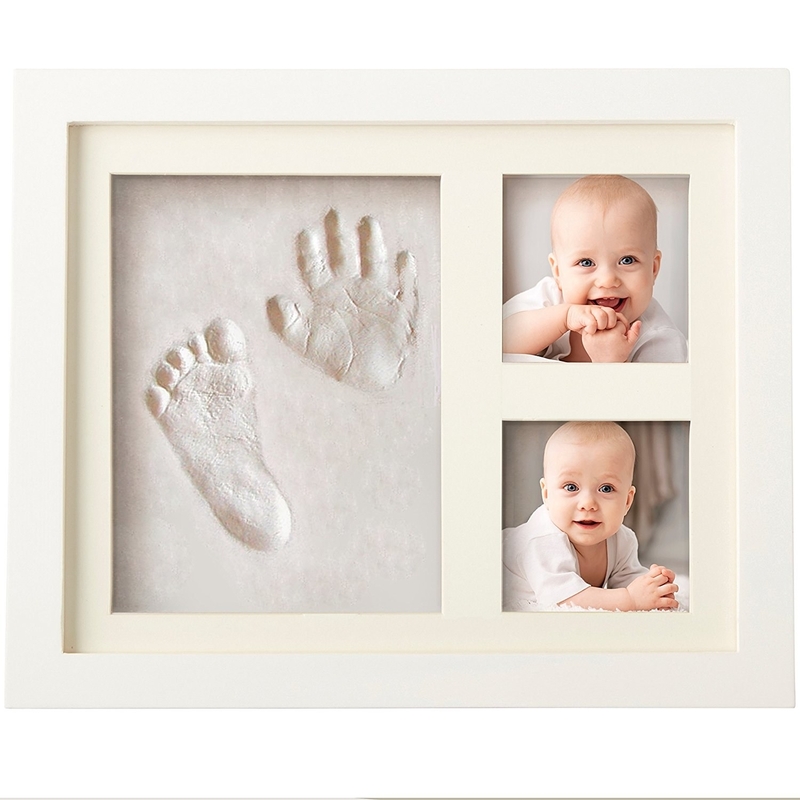 A baby footprint kit you can supply (along with two angelic pics) as a nursery treasure they can keep around 'til the kids graduate from high school, and then college, and then beyond! Includes everything they need to make the footprint! 6. A Rubik's cube — it'll give them a little more skin in the game for putting every block back in the right spot. Get it from Personalization Mall for $25.59. 7. A ~magical~ reveal pillow that'll provide some gripping entertainment during lulls on movie night. Order and send photos by Dec. 9th for delivery by Christmas. Get it from Inked and Foiled on Etsy for $28.99+ (available with or without a pillow insert and in several colors). Also check out a giant face pillow from the same Etsy seller. 8. 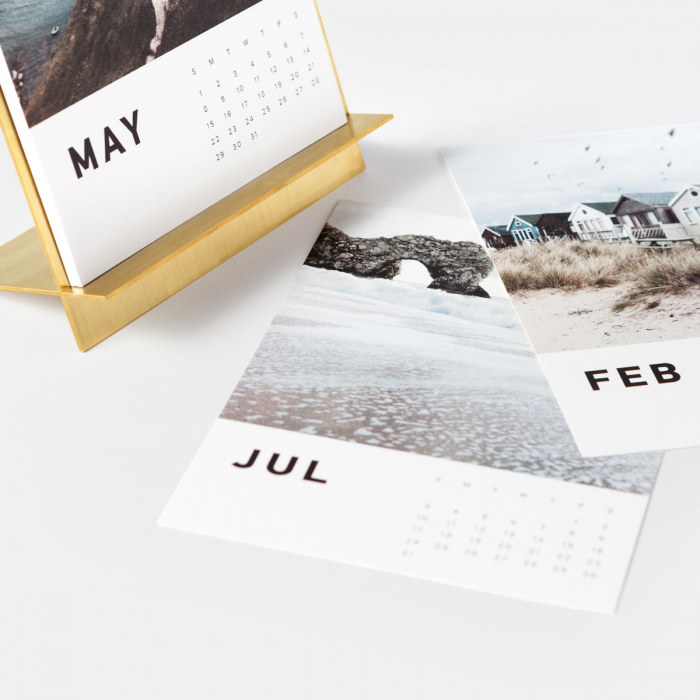 A custom calendar — it could be just the thing to brighten up their dim cubicle every single day. I've received a custom calendar before and LOVED it. Also, I just made a custom calendar for a friend (Shhhhhhh). Get one from Shutterfly for $17.99+ (available in a variety of customizable designs). 9. 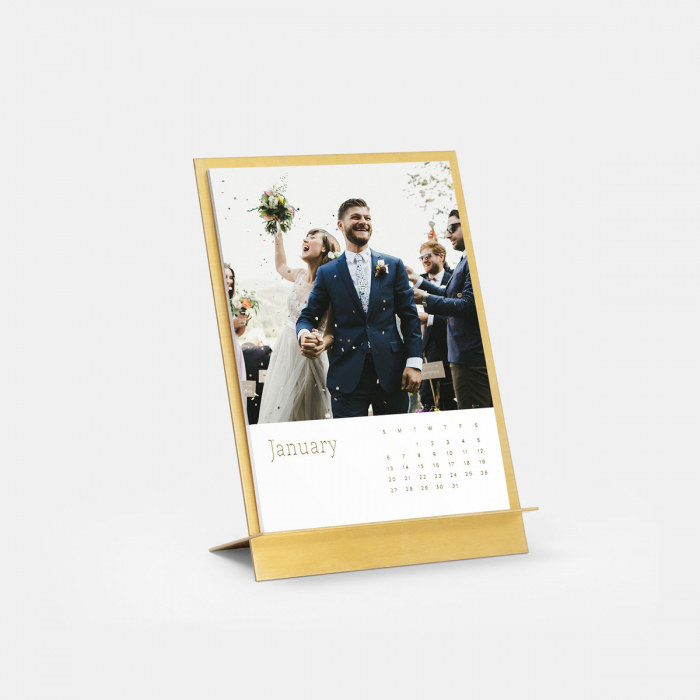 A reaaalllly pretty desk calendar with a brass easel as something to glance at to see quick dates. Get it from Artifact Uprising for $50+ (available in six designs). 10. A digital photo frame with ~unlimited storage~ you're required to tell them was on Oprah's list of favorite things this year. Works with iPhone or Android. Facial recognition software via the Aura app identifies your closet relationships and sends photos to your frame automatically. The frame works vertically or horizontally. Get it from Amazon for $249 (available in two colors). 11. Or a Google home hub that'll create photo slideshows and soooo many other things, like automate Christmas lights, recall a recipe they use once a year, and even add background music to a bedtime story. 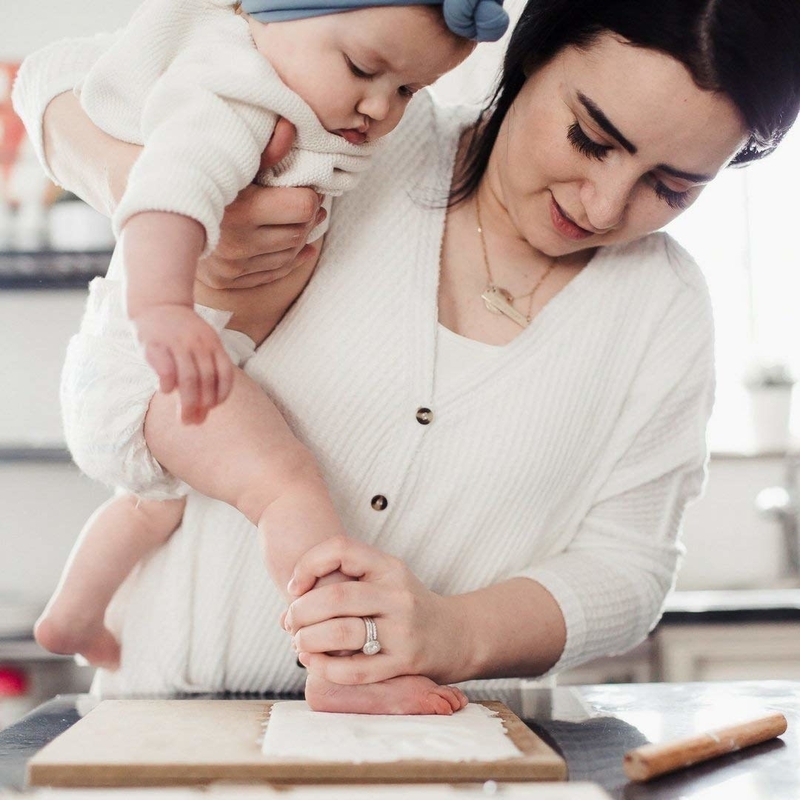 They can use their voice to show any of of their pictures in Google Photos, and with Live Albums, see the best and latest photos of loved ones. Which, tbh, is just barely scraping the service of all this device can do. Get it from The Google Store for $149. 12. 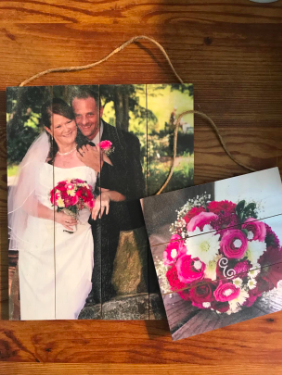 Wood pallet art as a rustic chic way to celebrate their love, an achievement, or just a fantastic trip! 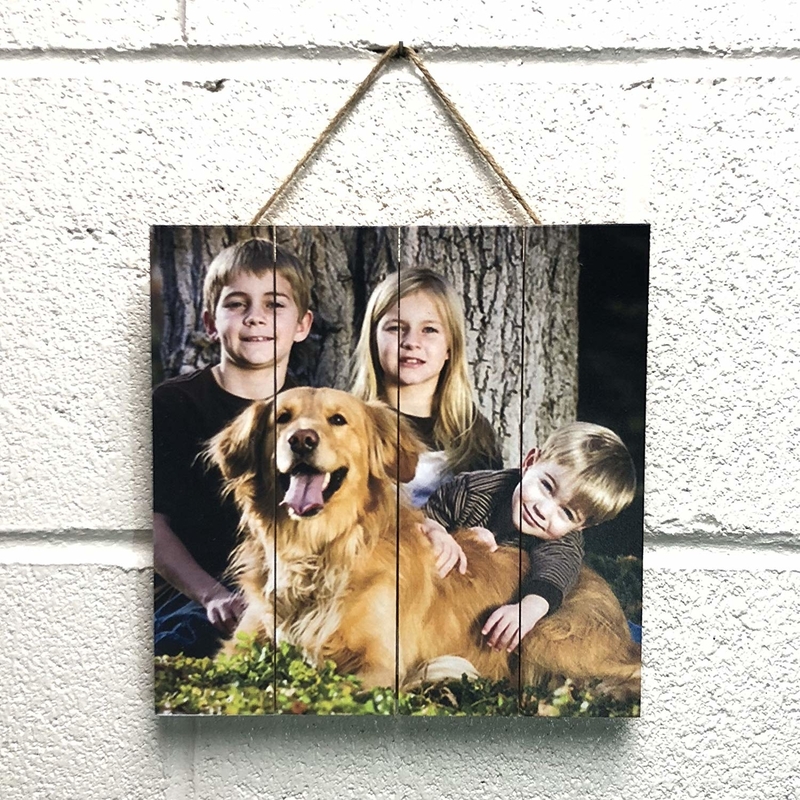 The photos are printed directly onto homemade wood pallets. Get it from Amazon for $19.99+ (available in six sizes). 13. A set of photo magnets you can split up between grandparents but, tbh, they're cheap enough to order multiple sets of so everyone can get a lil' fridge gallery! Get four 2"x2" magnets from Walmart for $6.90 (available in several sizes). 14. A custom prayer candle with their saintly likenesses emblazoned on it for a next-level gift. Not into saints? There are soooo many other options, including a knight, queen, king, devil, father and child, and more! Get it from Go Saint Yourself on Etsy for $22.50+ (also available with an extra label). 15. Or a custom Yankee Candle for the resident Yankee Candle head who always tells the clueless sibling to buy them something from there. Customize yours on Yankee Candle for $21.50+ (available in five candle types, various fragrances, and an option to add a message). 16. An adorable laptop case for your bae — or maybe your friend who just uploaded their engagement pics to Insta?! Get it from Walmart for $23. And check out more custom laptop cases. Get it from Uncommon Goods for $100+ (available in up to 11 block letters). 18. A charming luggage tag to help them distinguish their black roller suitcase from the confusing parade on the luggage carousel. Get it from Shutterfly for $5+ (available in two sizes). 19. A neat journal (or planner!) that'll clear up any nonsense about if that's actually Jack's or not. Clearly it is Jack's! Get it from Minted for $16+ (available as an address book, monthly, or weekly planner for an additional charge). 20. Photo cubes you can easily fill with up-to-date pics of all the grandkids. Get six from Amazon for $13.95. 21. A photogenic six-pack carrier (and matching beer labels) in case you've picked up home brewing and want to deliver a custom holiday shipment to your bud. 22. A personalized growth chart to hang on the wall and take with them when they move (instead of having to repaint over the lost marks)! Get it from Walmart for $23.88. 23. Large-format prints of you two standing on top of a mountain on that hike you went on the other weekend so you can celebrate those special moments you share together! Get them from Artifact Uprising for $15+ each (available in 20 sizes). Also check out some classic photo print sets with or without borders in a variety of sizes for $8+. 24. Framed lyrics and a photo that'd make an amazing gift for the new married couple in your life. Just saying. Get it from Grace Stone Designs on Etsy for $49+ (available in four frame options). 25. Printed golf balls to help eliminate any argument about whose ball is whose. Or can provide a sporty outlet for aggression with their arch nemesis's face printed on them. I am 51% kidding. Get 12 from Personalization Mall for $21.59+ (available in un-branded or Callaway balls). 26. Magnetic collage frames for bringing some order to a fridge jumbled with pics. OR you can include some prints for a free-filled photo gift! Each display holds five 4"x6" photos for a total of 10 pictures. Get two from Amazon for $17.50. 27. Or a heart snapshot collage so you can make sure that BEYOND A DOUBT everyone is represented in grandma's gift this year. Get it from Minted for $77.50+ (available with or without a frame, and three detail colors). 28. A wine bottle label for the resident super hero who also enjoys a lil' vino. Get it from Personalization Mall for $5.99. 29. A "watercolor" print of their new home (or just about anything else) created from a photo that'll look *so nice* hanging up in their home. Get it from Custom Canvas Creations on Etsy for $20+ (available in several styles and sizes). 30. A mini metallic photo light box where they can park their fave instant pic of the moment at their desk as a welcome distraction. 31. Or a light box if you want to do the decision-making for them when it comes to the pic worthy of display. Get it from Personalization Mall for $15.99+ (available in two sizes). 32. Marble coasters you can add captions to because they grow up so fast and who can keep track of how many months and days they are?!?!?! Get them from Uncommon Goods for $60+ (available with or without captions). If you're on a budget, check out a set of six cardboard ones from Walmart for $14. 33. An ~official~ size hockey puck your star player will make good use of on the ice. Get it from Personalization Mall for $9.99. Get it from Uncommon Goods for $65+ (available in 3–5 photos with an easel or hanging back frame). Also available in a neutral color scheme. 35. Custom s'mores kits with printed marshmallows that'll turn gathering around a fire pit into a delicious party. They have a shelf life of 3–4 weeks. Get 12 from Candy with a Twist on Etsy for $83.40+. 36. A metal bookmark can hold your spot while you spend some time with the protagonist of your bookmark. Get it from Shutterfly for $3.50. 37. A photo slate to commit your memories to rock. A flat rock. That also just happens to be photogenic! Get it from Bears Crate on Etsy for $22.50+ (available in three sizes). 38. A very good garden flag to advertise which very good pupper lives here. Get it from Personalization Mall for $15.99. 39. A curved glass print — it would just look SO GOOD on their desk. Get it from Shutterfly for $24.79+ (available in four sizes). 40. A pair of precious ornaments to help fill out the tree with your fave kids. Get them from Walmart for $15. 41. A lovey dovey photo collage in case you can't narrow down your fave pic of the couple to just one. Or two. Or five. Note that this is a frame with cutouts and you insert the images. Get it from Personalization Mall for $29.99. 42. A stately piece of wall art that'll let 'em show off a little local pride. Get it from Minted for $147+ (available with or without a frame, all 50 states). 43. And a colorful soft-cover book as a step-up from the peel-and-stick photo album pages of yore. Get it from Artifact Rising for $20+ (available in three sizes, six cover colors, three text foil colors, and five themes). And check this round-up of custom gifts pet owners will love for more great gift ideas.